Summer is still in full swing as August begins, and there’s still plenty of time for you to get outside with your dog to enjoy the beautiful weather! While you’re more than welcome to run around in the sun and play lots of games of fetch with Fido, it’s imperative that you remember to keep your buddy safe when you’re outside. Read up on these 7 tips to help keep your BFF safe in the summer weather! Don’t Exercise in the Heat – Your pet loves going for nice long walks and would fetch that Frisbee with you all day long if he could. In the summer, however, you have to be aware of the time of day you exercise with your dog. Hot summer days mean you will need to modify your workout and play routines since overexertion in the heat can lead to heatstroke or heat exhaustion for either one of you. Choose to go for walks during breezier early morning or evening hours. Stay out of the sun as much as you can to avoid heat stroke, sunburn, and burned paws scorched by hot pavement. Stay Safe in the Sun – Speaking of the sun, you aren’t the only one who can get sunburns. Your furry buddy can, too! Breeds most susceptible to sunburn include those who have short hair, pink noses, or fur loss from illness, hormonal fluctuations, or allergy. The belly is also extremely vulnerable to the sun. Keep your pet out of strong sunlight as much as possible and provide shade for her if she is an outside dog. Protect the Paws – The summertime heat doesn’t just affect one’s skin; it also heats up the pavement and roads so much that it can burn unprotected skin and padding, including your dog’s feet. When you do go for walks, make sure your dog has grass or dirt underfoot so he can walk in a cooler, more comfortable area. If that isn’t an option, invest in some lightweight dog booties to protect their tender paws from the hot pavement. Keep Him Hydrated – Whether you’re off to take a short walk or out to go hiking with your pal, bring along plenty of clean water for Fido (and you!) to drink. Be sure that the water comes in a comfortable container for your pet to sip small amounts of water from. In the yard, be sure to leave a bowl full of clean drinking water and change it out regularly to prevent any mosquito infestation. Say No to Parasites – Summertime is the time of year in which ticks, fleas, mosquitos, and other insects are at their worst. 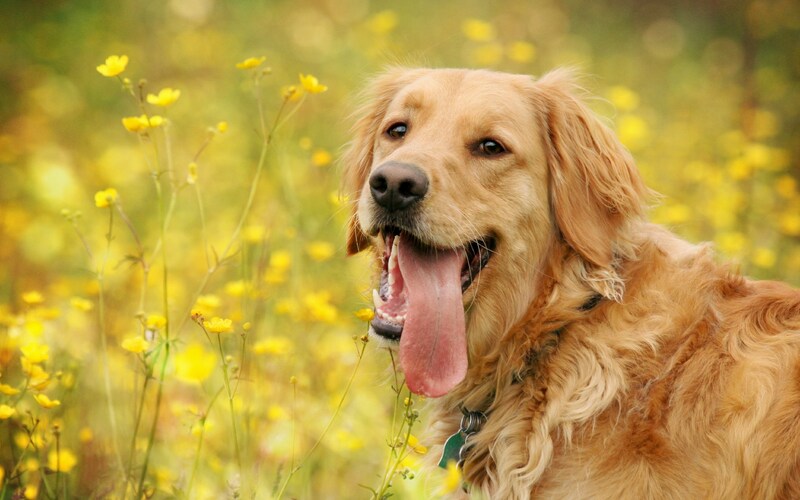 Make sure that your pup is fully protected from fleas and ticks with the proper monthly medication. Discuss appropriate protective measures such as collars, sprays, shampoos, dips, and more with your vet before trying something on your own. Consider also getting your dog de-wormed as worms are fairly common and can cause problems for your pooch. Be Cool About Pool Water – Most dogs love swimming, and it can be a fun activity for you and your dog to enjoy together! When you go for a swim with your pal, be aware of the chlorine and other chemicals present in the water. Whenever you’re done in the water, rinse your dog with fresh water since chlorine can irritate a dog’s skin and upset its stomach. Be Aware of Stinging and Biting Insects – Both bee and wasp stings can be poisonous to dogs, so keep an eye on your buddy when he’s in the yard. Try to keep him away from high-risk areas on walks and hikes and sway him away from playing in your garden. Keep your yard clean and devoid of leftover foods to deter wasps and bees, and regularly inspect your land for nests. If your dog is stung, stay calm, move him away from the area, and examine him. If this happens to be his first time being stung, take him to the vet to make sure he’s okay. Don’t be alarmed if he starts to swell; some swelling is natural, and dogs can take some of the same antihistamines that we humans can take. Can’t be with your dog during the hot weather? Want to provide your pal with a fun way to cool off? Take him to BauserHaus! He’ll have lots of fun playing and interacting with other dogs. Our beautiful facility is also air-conditioned and gives pups a great place to chill out – literally! Call us at (314) 961-3911 or check us out online at www.bauserhaus.com to learn more about us. This entry was posted in Tips and tagged BauserHaus, doggie daycare STL, how to care for dog during summer, summer safety tips, summer tips for dogs. Bookmark the permalink.